Did you know that "rube goldberg" is a term named after Reuben Lucius Goldberg, a Pulitzer Prize winning cartoonist, sculptor, and author. He was actually trained as an engineer but instead he became a cartoonist where he would show how people would create a complex sequence to do a simple task. You know.... sort of like government bureaucracies? Thinking of that, it's funny to me how rube goldbergs are associated with engineering and learning when in actuality, it is named after someone who gave it all up to become an artist. But if you think about it, it's not all that strange. Science and art is sometimes the same thing. Motivation to test new ideas? A stunt pig? Sure it is! That is right. Weird and Wacky Contraption Lab is an art project. What else would it be? What is the point of making a chicken rocket off a wall? Or even create a series of sometimes-complex steps to make a stunt pig rocket off a wall? Why don't you just press the button and send the pig off? Better yet, just pick up the pig and throw it? These thoughts might occur to a child when they start getting frustrated building any rube goldberg. But have no fear. Number 7 and his mechanical-engineer-turned-English-professor-dad is here! If someone told you that building a ball-run is hard, you'd probably say, make it simple but if you are telling someone that your making your art project is hard, you'd probably tell them to have a glass of wine and relax and then go back to it. Why? Because it is worth it to try hard to express your vision. Art is really important that way. That's why I like this toy so much. It is a great way to practice "constructivist learning." You go at your own pace. There are pieces there and you can start off with easy steps and once you master that, you can make it more and more complex. The stunt pig acts as the muse to make your art (or science) more complex. You do not have to replicate the picture on the box as soon as you open the package. Depending on the child, you might actually want to present it to her/him with no box and if anything make a simple two step drop to show that the pig will fly off the wall. Leave the pieces out and say nothing and see what happens. This is not what Number 7 did. 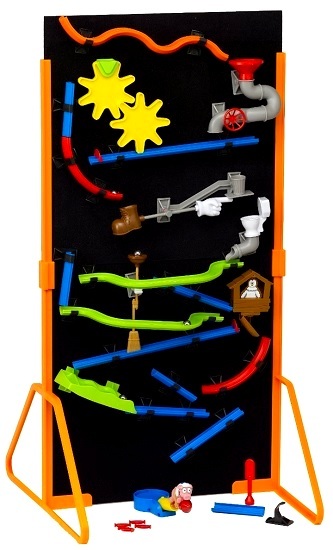 He did what every other kid would do, he opened the box of Weird and Wacky Contraption Lab and started playing with it. While he had tons of fun, there were moments of frustration. It was hard to get the angles "just right" but his dad ... so smart.... showed him how to simplify things and that got him back on track. Back on track actually means making it more complex! It always makes sense to take one step back when you are frustrated. Kids need to see the big picture too. Number 7's family including the toddler (they are always watching her of course, don't want to swallow anything) loved this toy and they also had one very good suggestion. If your child has trouble adjusting, it could be because they don't know how much they moved an object. Drawing a grid on the wall can help. What a great idea!!! This family is mega smart. I supposed you can use a metallic marker, white marker, or even chalk. Gosh, by making a grid, kids can give each other crazy-specific instructions. Some may not do it but some may... what a way to share a project! ideas... use them or don't use them. You may ask how this is art but if you think about how we are watching a ball fall into something to make it hit a shoe and then hit a hen house and then a toilet and then make it go somewhere else and so on... you are seeing the upside to all of it. It sounds like a story plot doesn't it, with all the twists and turns? It's entertaining. It's a visual delight. This is both art and science and yes, science can be very entertaining! The secret is out. Science is a blast. If you like Weird and Wacky Contraption Lab and believe science is fun then I highly recommend that you go to SmartLab's facebook page and give it a good sound liking. I had no idea this was there. This way you can stay on top of what is new in the "FREE ZONE." Tester 7's mom was happy to see this too. 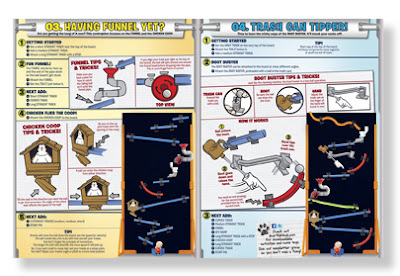 There are fun ideas on very well-designed pages that cover activities, trivia, and coloring options too. They even run weekly giveaways. And make sure you read this awesome New York Times article about science toys. Loved this! Also, I think I read that contraption below didn't quite make it as a "rube goldberg" in the big rube goldberg contest of all contests but holy cow!!! You have to watch this! Lego fans will implode. And now here's your chance to win your very own Smart Lab Weird And Wacky Contraption Lab! How cool is this??? Just fill out the Rafflecopter form below! Try your best to use Facebook box below to comment. I really want to hear your opinions! Disclosure: Toys are Tools was not compensated by the manufacturer for the publication of this review. The item was submitted to Toys are Tools to facilitate a review. Reviews are never promised. The giveaway prize is offered by the manufacturer. We have a marble maze, but it's nothing like this. Love how amazingly creative this is! Looks awesome! Finally retired our old marble maze a few months ago due to missing parts, time for a new real one instead of using Crazy Machines, which is a cool game if you haven't tried it! ooh, is this a screen-game only? It's looks lovely, do you recommend to play on iPad, Android. Windows??? ?